Hi everyone, I hope you are having a great Easter with your family and friends. I also hope that you are finding some time to create. I’ve only had a little bit of time to create so far but I hope to make more time to create soon. 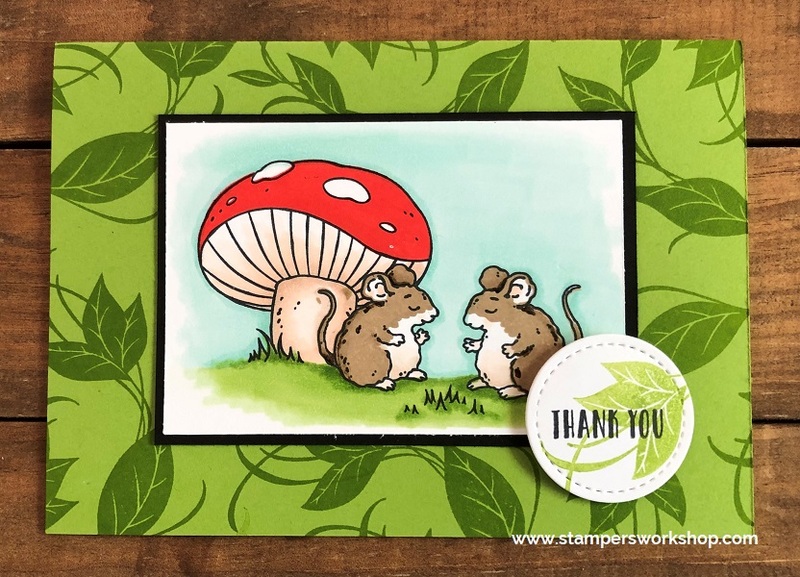 Today I am sharing a card featuring some cute little mice from the Sweet Storybook stamp set. I love this set but haven’t really given it enough love so far. That had to change so I grabbed the set and inked it up. 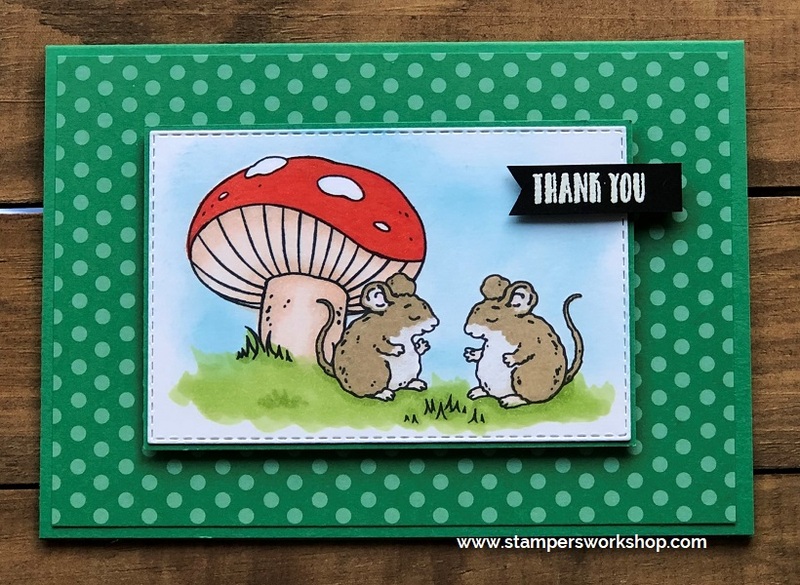 The stamp set does come with a couple of solid stamps so I used them to add colour to the mice and the top of the toadstool. I then used my Stampin’ Blends to colour in the rest of the image. To create the sky I used my sponge daubers and Pacific Point ink. Taking a Rectangle Stitched die, I die cut the image and then layered it on Call Me Clover cardstock. This is the same colour I used for my base card. I took a piece of patterned paper from the In Colour 6″x6″ pack and layered this on my card base. I decided to pop up the coloured panel to give a little extra dimension. Finally, I finished off the card with a white embossed sentiment. I love creating sentiment strips like this. Aww, they are such cute mice! It was such a fun image to colour. I hope you’ll pick out a stamp set which hasn’t had enough love and stamp it up today too. Hi everyone, today I am so excited to participate in my first ever Blog Hop. I’ve been stamping for many years but have never participated in one before. 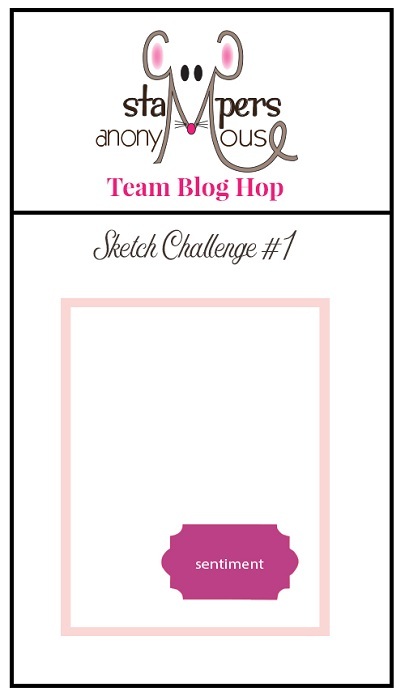 This is the first Blog Hop for the Stampers Anonymous group and the first challenge is a sketch challenge. You can see I used the basic sketch principle but used it in landscape instead of portrait. It was so fun to participate! The other participants have created such gorgeous cards! I know you are going to love hopping with us!